Endothelial dysfunction is found in different pathologies such as diabetes and renal and heart diseases, representing one of the major health problems. The reduced vasodilation of impaired endothelium starts a prothrombotic state associated with irregular blood flow. We aimed to explore the potential of amniotic fluid stem (AFS) cells as a source for regenerative medicine in this field; for the first time, we focused on third-trimester amniotic fluid AFS cells and compared them with the already-described AFS cells from the second trimester. Cells from the two trimesters were cultured, selected and expanded in normoxia (20 % oxygen) and hypoxia (5 % oxygen). Cells were analysed to compare markers, proliferation rate and differentiation abilities. Endothelial potential was assessed not only in vitro—Matrigel tube formation assay, acetylated human low-density lipoprotein (AcLDL) uptake—but also in vivo (Matrigel plug with cell injection and two animal models). Specifically, for the latter, we used established protocols to assess the involvement of AFS cells in two different mouse models of endothelial dysfunction: (1) a chronic ischemia model with local injection of cells and (2) an electric carotid damage where cells were systemically injected. We isolated and expanded AFS cells from third-trimester amniotic fluid samples by using CD117 as a selection marker. Hypoxia enhanced the proliferation rate, the surface protein pattern was conserved between the trimesters and comparable differentiation was achieved after culture in both normoxia and hypoxia. Notably, the expression of early endothelial transcription factors and AngiomiRs was detected before and after induction. When in vivo, AFS cells from both trimesters expanded in hypoxia were able to rescue the surface blood flow when locally injected in mice after chronic ischemia damage, and importantly AFS cells at term of gestation possessed enhanced ability to fix carotid artery electric damage compared with AFS cells from the second trimester. To the best of our knowledge, this is the first research work that fully characterizes AFS cells from the third trimester for regenerative medicine purposes. The results highlight how AFS cells, in particular at term of gestation and cultured in hypoxia, can be considered a promising source of stem cells possessing significant endothelial regenerative potential. Hypertension, coronary artery disease, peripheral artery disease, and chronic renal failure are correlated with endothelial dysfunction and a pro-inflammatory state, the earliest events in the onset of atherosclerosis. The effects of the artery occlusion are one of the major health problems, particularly in the adults  while in children reconstruction after major oncological or vascular surgery remains a difficult task. In this scenario, one of the greatest challenges is to obtain endothelial cells from non-vascular cell sources and researchers pay much attention on the use of embryonic and fetal stem cells as source for cell therapy. Endothelial progenitor cells derived from induced pluripotent stem and embryonic stem cells [2, 3], Wharton Jelly and umbilical cord blood (CB) cells  have been recently employed to recover the endothelial function after ischemia, but restricted therapeutic use due to safety issues and weak differentiation efficiency is limiting the applications of these cells. A specific subset of amniotic fluid stem (AFS) cells presenting the surface antigen CD117 (or c-Kit, the receptor for the stem cell factor, or SCF) has been isolated, demonstrated to be broadly multipotent [4, 5], and can be reprogrammed without viral transduction . Because of their fetal but non-embryonic origin, AFS cells overcome many ethical concerns; moreover, they are easy to obtain from routinely scheduled procedures during the second trimester of pregnancy (i.e., amniocentesis and amnioreduction) , retain immunoprivileged properties  and do not form teratoma once injected in vivo . Although CD117+ cells represent about 1 % of the initial cellular fraction of the whole amniotic fluid (AF) , their specific identification and subsequent expansion ex vivo make them a suitable candidate for regenerative medicine. While second-trimester AF requires a safe but invasive procedure during pregnancy, third-trimester AF could be taken at birth during cesarean sections . Until now, it is not clear yet whether AFS cells isolated by the surface marker c-Kit could be found at term, since third-trimester AF cells have been isolated by their adhesion properties, rather than specific marker selection or by clonal approach , showing, for instance, osteogenic potential after differentiation in defined medium (evaluated by gene transcription) . Here, we focused in particular on endothelial commitment with AFS cells from the second and third trimesters to promote vascular repair and restore perfusion in ischemic tissues. Additionally, we wanted to explore whether by culturing AFS cells in hypoxia we could improve their culture conditions. It is well known that stem cells normally reside in hypoxic niches , so next to the usual cell cultures performed under atmospheric oxygen tension (20 %), there are now many protocols for cell expansion at low oxygen concentration [14, 15]. Indeed, with particular attention to a long-term culture, hypoxia inhibits senescence, increases the proliferation rate, influences the potential of differentiation and modulates the paracrine effects of stem cells, causing upregulation of various secreted factors . It has been demonstrated that in vivo oxygen tension changes from the periphery to the centre of an organ, with a lower oxygen level where stemness has to be maintained . Within this context, mimicking the natural environment, oxygen became an important factor for in vitro stem cell expansion and potency studies. In this study, we focused on characterizing and comparing AFS cells from the second and third trimesters, giving emphasis on methods of isolation and expansion, phenotypic profile and endothelial marker expression pattern under normoxic and hypoxic conditions. The endothelial commitment of AFS cells cultured in hypoxia was also tested in vivo both in a mouse model of ischemic damage and in a carotid injury model. The samples were collected in compliance with the Helsinki Declaration. AF samples were obtained after approval of the local ethics committee (Azienda Ospedaliera of Padova Pr. N. 32887/451P) by two different gestational periods from donors who signed informed consent. Specifically, (i) second-trimester AF samples were collected during routine amniocentesis performed at mid-gestation (16–18 weeks) for genetic screening purposes. Each sample was harvested as leftover material from amniocentesis. Only healthy samples were used. (ii) Third-trimester AF derived from healthy women undergoing eligible cesarean section. AF from cesarean section was unused material for clinical purposes. Samples were processed in accordance with the previous described method . Briefly, cells from AFs were seeded on glass coverslips, and adherent cells were then positively selected for CD117 by using the MACS CD117 MicroBead Kit from Miltenyi Biotec (Bergisch Gladbach, Germany). Cells were cultured by using reconstituted Chang Medium C Lyophilized (Irvine Scientific, Santa Ana, CA, USA) before selection and then in expansion medium consisting of minimum essential medium alpha (Gibco, now part of Thermo Fisher Scientific, Waltham, MA, USA) containing 20 % Chang medium, 15 % fetal bovine serum (Gibco), antibiotics and L-Glutamine (2 mM final). Cells were maintained under standard 20 % O2, 5 % CO2 and 95 % relative humidity, referred to as “normoxia”. Cells were also cultured under “hypoxia” at 5 % O2 by using a CO2/O2 controller connected to a hypoxic chamber (BioSpherix, Lacona, NY, USA). Between 50 and 100 cells were seeded on 96-multiwell plates, and proliferating cells were evaluated after 1, 2, 3, 6, and 9 days in culture. Cells were fixed with paraformaldehyde (PFA) (Sigma-Aldrich, St. Louis, MO, USA) 4 % in phosphate-buffered saline (PBS), washed in PBS twice for 5 minutes, a brief permeabilization was carried out with Triton X-100 0.5 % in PBS and cell nuclei were stained with 4′,6-diamidino-2-phenylindole (DAPI) (Sigma-Aldrich, St Louis, MO, USA). Cell numbers were evaluated by counting the nuclei on a series of randomized fields for the different samples and for each time point. FACSCalibur™ and Accuri C6 (BD Biosciences, Franklin Lakes, NJ, USA) flow cytometers were used. Acquired data were analyzed by using FlowJo software (TreeStar Inc., now part of FlowJo LLC, Ashland, OR, USA) after gating on viable cells. Cells analyzed starting from freshly retrieved AF samples were filtered through 70-μm nylon mesh filter and then stained as described above. Fresh AF and expanded AFS cells after different passages in culture were analyzed with antibodies listed in Table 1. The staining solution consisted in PBS containing Triton X-100 (0.1 %; Fluka,), DNAse-free RNAse A (0.2 mg/ml; Sigma-Aldrich, St Louis, MO, USA) and propidium iodide (1 mg/ml; Sigma-Aldrich, St Louis, MO, USA). After resuspension in cold PBS and ethanol, tubes were stored at −20 °C for at least 24 hours. After staining with 300 μl/106 cells of staining solution, cells were analyzed. To test the endothelial potential of AFS cells, we used the endothelial cell tube formation assay  over Matrigel™ Basement Membrane Matrix (BD Biosciences, East Rutherford, NJ, USA). Human umbilical vein endothelial cells (HUVECs), kindly provided by Marina de Bernard (University of Padova), were cultured in endothelial medium (PromoCell, Heidelberg, Germany) and used just after passage 2. AFS cells and HUVECs were detached from the original expansion culture and seeded in EGM-2 (endothelial growth medium-2) medium (Lonza, Basel, Switzerland) at a concentration of 15,000 cells/cm2 over the solidified coating. ImageJ software  coupled with Carpentier G. Angiogenesis Analyzer  was used. For immunostainings, cells were fixed with PFA 4 % in PBS and permeabilized with Triton X-100 0.5 % in PBS. To test functionality , EGM-2 medium was replaced with fresh medium containing Alexa Fluor® 488 conjugated with 10 μg/ml acetylated human low-density lipoprotein (AcLDL) (Molecular Probes, now part of Thermo Fisher Scientific). After 6 hours, medium was removed, and cells were fixed with PFA 4 % for later observation. Cell nuclei were counterstained with DAPI. All the procedures involving animals and their care were conducted in accordance with international guidelines, with the National Institutes of Health Principles of Laboratory Animal Care (National Institutes of Health publication 85–23, revised 1985) and were also approved by the local ethics committee for animal care of the University of Padova (organismo per il benessere degli animali, or OPBA). BALB/c strain Rag2−/−γc−/− immunodeficient mice were used in order to avoid the possible cell rejection after xenotransplant; 1 × 105 cells per plug were resuspended in 500 μl of Matrigel with 0.75 mg/ml heparin (Pharmatex Italia, Milan, Italy), 50 ng/ml mouse recombinant fibroblast growth factor-basic (PeproTech, Rocky Hill, NJ, USA) and 100 ng/ml human recombinant VEGF (PeproTech). Mice were anesthetized with isoflurane, and cold liquid Matrigel containing cells or PBS was injected in the back lumbar region. After 14 days, mice were euthanized and plugs were harvested to obtain cryosections or to measure hemoglobin (Hb). BALB/c strain Rag2−/−γc−/− immunodeficient mice were subjected to hind-limb ischemia on the right and left hind limbs . After anesthesia with xylazine (20 mg/kg) and ketamine (100 mg/kg) by intraperitoneal injection, the femoral artery was excised and cauterized from its proximal origin as a branch of the external iliac artery to the distal point where it bifurcates into the saphenous and popliteal arteries. Forty-eight hours after ischemic damage, 5 × 105 AFS cells cultured at 5 % O2 from the second (four mice) or the third (four mice) trimester were injected in the adductor muscle of the right leg while the left leg was used as control and PBS was injected (four mice). Hind-limb microvascular perfusion was measured with the Periscan-Pim II Laser Doppler System (Perimed AB, Järfälla, Sweden) 15 days after surgery. Specifically, Perimed proprietary software was used to calculate the ischemic ratio by dividing the perfusion of the ischemic limb versus the controlateral limb. 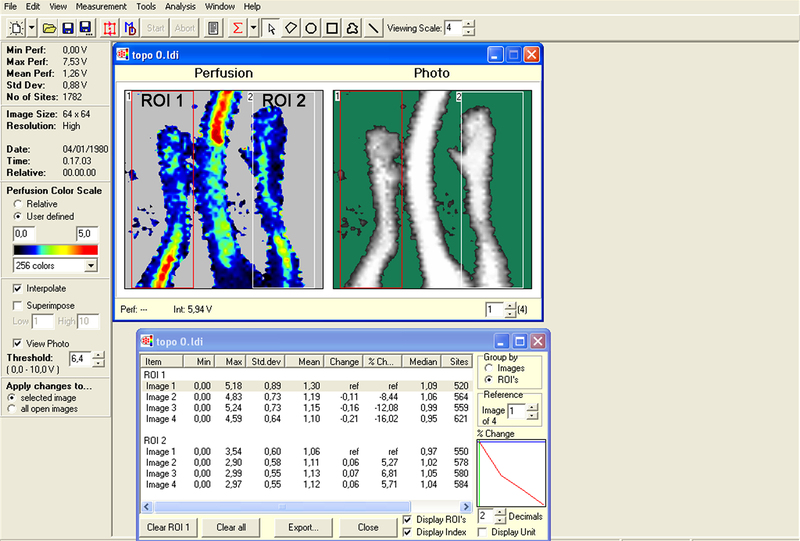 For this specific calculation, region of interest (ROI) was chosen including each hind limb (left and right, respectively) captured by the laser Doppler image. Each ROI was equal in size for right and left hind limbs (Additional file 1). Each measure was repeated five times. In accordance with the procedure described in Brouchet et al. , the left common carotid artery was exposed via an anterior incision of the neck in 8-week-old BALB/c strain Rag2−/−γc−/− immunodeficient mice (four mice with PBS as control, four mice with AFS cells from the second trimester and four mice with AFS cells from the third trimester) weighting 20 g on average and under isofluorane anesthesia. The carotid artery was injured by electricity with a bipolar microregulator (Pfizer, New York, NY, USA), and a 2-W discharge was applied for 2 seconds to each millimeter of carotid artery over a total length of 4 mm with the help of a size marker placed parallel to the long axis of the carotid. Three days later, the endothelial regeneration process was evaluated by staining the denuded areas with Evans blue dye as previously described . Briefly, anesthetized animals were systemically injected via tail vein with 500 ul of 1 % Evans blue in PBS. After 30 minutes, animals were euthanized and immediately perfused with 50 ml of PBS to remove excess of Evans blue. The left common carotid artery was dissected and placed between slides with mounting medium (Bioptica, Cambridge, UK). Pictures were acquired by using a Leica DMI 6000B inverted microscope (Leica, Wetzlar, Germany), and the ratio between the damaged area stained in blue and the total carotid artery area was calculated by using ImageJ software. Matrigel plugs were fixed for 1–2 hours with PFA 4 % in PBS and then dehydration was performed by sucrose gradient method at 4 °C with sucrose 10 % in PBS for 1 hour, 15 % for 1 hour and 30 % overnight. Pieces were then frozen in liquid nitrogen. Muscle samples were frozen by submersion in isopentane cooled with liquid nitrogen. Cryosections were obtained after embedding samples in OCT (optimum cutting temperature) compound (Kaltek, Padua, Italy) and using a cryostat (Leica) to produce sections. For specific antibody concentrations and conditions, see Table 1. Phase-contrast and bright-field pictures were taken by using an Olympus IX71 inverted microscope (Olympus, Tokyo, Japan). Immunofluorescence pictures were acquired by using a Leica DMI 6000B inverted microscope. Matrigel plugs were smashed with liquid nitrogen and the resulting powder was put in distilled water. Cell residues were pelleted and supernatants were used for Hb quantification by using Drabkin’s Reagent (Sigma-Aldrich). Reaction product absorbance (or optical density) was read at 540 nm with a SpectraMax Plus Spectrophotometer (Molecular Devices). Hb values were normalized for the protein content of Matrigel plugs, obtained by using Bradford Reagent (Sigma-Aldrich) and in accordance with the instructions of the manufacturer. Briefly, after incubation of an aliquot of lysate (the same used for Hb quantification) with the reagent and incubation for 30 minutes at room temperature, protein absorbance was read at 595 nm. Total RNA, including small non-coding RNA, was extracted by using miRNeasy Mini Kit (Qiagen, Venlo, The Netherlands) in accordance with the instructions of the manufacturer. RNA was quantified by using Nanodrop2000 (Thermo Fisher Scientific), and 1 μg was retrotranscribed with miScript II RT kit (Qiagen) by using HiFlex buffer that allows the further quantification of both mature miRNA and mRNA. All procedures were carried out by following the instructions of the manufacturer and using GeneAmp® 2720 thermal cycler (Applied Biosystems, Waltham, MA, USA). For mRNA analysis, quantitative real-time polymerase chain reaction (qPCR) was performed by using Platinum® SYBR® Green qPCR SuperMix-UDG (Life Technologies, Carlsbad, CA, USA), 5 ng of cDNA and a 300 nM mix of specific forward and reverse primers (final concentrations). For miRNA quantification, qPCR was performed by using miScript SYBR® Green PCR Kit (Qiagen), 10 ng of cDNA and specific miScript Primer Assays (Qiagen). Reactions were carried out in a LightCycler II instrument (Roche, Basel, Switzerland). Results are expressed in arbitrary units (A.U.) considering the ratio targetRNA/referenceRNA content (reference for mRNA: β2MICROGLOBULIN, abbreviated “B2M”; reference for miRNA: RNU6-2). For the mRNA and miRNA primer sequence list, see Tables 2 and 3. Data are expressed as standard error of the mean, and statistical comparisons were performed by using Student’s t test or one-way analysis of variance, as appropriate. Post-hoc Bonferroni’s correction for multiple comparisons was used. All P values of not more than 0.05 were considered statistically significant. The phenotypic characterization of freshly isolated cells from both trimesters revealed high variability on the presence of CD117+ cells, and some samples possess a high portion of CD117+ cells and this was noticed for both the trimesters (7.84 ± 6.50 % and 4.17 ± 3.26 % for the second and third trimester, respectively; Fig. 1a); this is due to the intrinsic variability among samples. In keeping with other studies on CD117+ cells, cells from the second or third trimester were negative for the hematopoietic markers CD34 and CD45 and positive for the mesenchymal molecules CD73 (5′-nucleotidase), CD44 (a receptor for hyaluronic acid and others components of extracellular matrices), CD105 (endoglin type I glycoprotein), CD90 (also called Thy-1) and CD146, a cell adhesion molecule also marking the endothelial lineage (Fig. 1b). In particular, in the third trimester, we detected only a small portion of CD117+ CD90+ cells while CD117+ CD105+ cells were more abundant. This difference in antigen expression was not detected in expanded cells. The fresh CD117+ fraction did not co-express molecules of the major histocompatibility complex type II (specifically HLA-DR), whereas the major histocompatibility complex type I (i.e., HLA-ABC) was present. The surface antigen CD9 was markedly detected in different proportion in the two trimesters: it was found exclusively on the CD117− fraction of the second trimester, and it was detected in almost all CD117+ cells of the third trimester. Cells yielded from third-trimester AF samples were usually higher in terms of number of cells per milliliter and had a more heterogeneous morphology after seeding when compared with the second trimester. However, we were able to obtain adherent c-Kit+ colonies with cells proliferating for several passages from cells derived from both trimester samples in normoxic and hypoxic conditions (Figs. 2a, b and 3a). Similarly to what was observed before, the expression of c-Kit decreased after some passages in culture . Importantly, there were some differences between the cultured cells, as shown in Fig. 2e. In second-trimester samples, there was a greater percentage of cells expressing CD117 after expansion in hypoxia rather than in normoxia, whereas third-trimester AFS cells (Fig. 2f) displayed a similar percentage of CD117+ cells concerning the two oxygen tensions; notably, this percentage was considerably higher in the third than in the second-trimester cells. Regarding other markers, as shown in Di Trapani et al. , on one hand, cells were negative for the low-affinity nerve growth factor receptor (LNGFR), referred to as CD271, a versatile marker used to select multipotent mesenchymal stem cells , CD31 for mature endothelium, CD45 and CD34; on the other hand, cells were positive for the adhesion molecules CD166 (activated leukocyte adhesion molecule, or ALCAM), CD184, CXCR4, receptor of the stromal derived factor-1, or SDF-1), CD146, CD29 and CD44. In addition, the specific stem cell antigen, stage-specific embryonic antigen 4 (SSEA-4), was significantly present at low oxygen in AFS cells at term (Additional file 2). Cell cycle (G0 and G1, S or G2 and M) was similar independently from the trimester of origin or from the oxygen condition (Fig. 3b, left graphs) underling the good cell division ability of both fetal cells. On the other side, the proliferation rate was increased for cells grown in hypoxia: after culturing at 5 % O2, significantly more cells were obtained for both trimester samples compared with their counterpart cultured in normoxia (P < 0.001, with an increase up to seven times the total number of cells, Fig. 3b, central graphs). The estimated doubling time came to be significantly diminished from culture at 5 % O2 in comparison with 20 % O2 (P < 0.05 for the second trimester and P < 0.001 for the third trimester), whereas there was no difference on the doubling time between cells of different trimesters expanded at the same oxygen level (Fig. 3b, right graphs). The doubling time in normoxic environment was consistent with previously reported studies on AFS cells . Cells from both trimesters were assessed for their osteogenic and adipogenic potential. AFS cells in all conditions were able to deposit calcium oxalate and to produce lipid vacuoles when induced to differentiate respectively in osteoblast-like and adipocyte-like cells (Additional file 3), confirming their ability to differentiate into mesenchymal-derived lineages. To unravel whether AFS cells possessed a molecular signature toward endothelial differentiation, we quantified the expression of ETV2, FLI1 and ERG1, members of the E-twenty six transformation (ETS) family of transcription factors, which direct angiogenesis and endothelial progression  from development to post-natal life. Notably, AFS cells at the basal state strongly expressed ETV2, which is the earliest ETS factor to be activated. This is consistent with their fetal origin since ETV2 is present in endothelial precursors during development and normally absent in adult cells (Fig. 3c, left). FLI1, present in a more mature endothelial state, was also expressed, although at lower levels (Fig. 3c, centre), whereas ERG1 was not detected. Moreover, VEGF transcript, an important endothelial marker, was also found in AFS cells before endothelial induction (Fig. 3c, right). Through the Matrigel tube formation assay, we were able to obtain successful formation of endothelial tubes mimicking capillary-like structures by using AFS cells from both trimesters after expansion in 20 % or 5 % O2 (Fig. 4a). The total area comprised in the meshes was similar in all conditions and comparable to that of HUVECs, used as a standard control. The branching interval was also equal among samples and conditions, indicating uniformity of structures and similarity in response to the endothelial cell tube formation assay. Mesh index and mean mesh size of AFS cells were similar to HUVECs or higher (Fig. 4b). Capillary-like structures expressed von Willebrand factor (vWF) in samples from both trimesters and cultured at both oxygen tensions (Fig. 4c), and the endothelial functionality was acquired as demonstrated by the uptake of the lipoprotein AcLDL (Fig. 4d). In addition, we analyzed the expression of AngiomiRs, specific miRNAs that can promote or block the angiogenic process. In particular, miR126, 132 and 210 are key positive regulators of angiogenesis and endothelial cell survival, whereas miR221 and 222 prevent endothelial cell migration . miR126, 132, 221 and 222 were detectable in AFS cells at the basal state, whereas miR210, which was absent before angiogenic induction (Fig. 4e), was present already after 6 hours of endothelial differentiation and decreased 72 hours after endothelial stimulation in all the analyzed conditions. After 6, 24 and 72 hours of angiogenic induction, miR126 and 132 did not significantly change the expression level, as the anti-angiogenic miR221 and 222 were detectable in a quite stable trend. Together with ETS factors and VEGF expression data, these results suggest that AFS cells are transcriptionally open for the angiogenic pathway; therefore, they may recognize and respond to proper stimuli and undergo endothelial differentiation. Lack of markedly different expression level between the two trimesters underlined the endothelial imprinting of the two cell types. To confirm their propensity to generate functional vessels, AFS cells were also implanted in vivo, and neo-formed and perfused vessels were detected in Matrigel plug assay performed in immunodeficient mice (Fig. 4f). This macroscopic observation was further investigated by quantifying the Hb content in plugs from each condition in comparison with the relative controls. Every sample contained significantly higher levels of Hb with respect to controls while the optimal state was represented by the cells cultured in hypoxia (Fig. 4f, graph). In all of the different culture conditions, some vWF-expressing structures were also positive for the human mitochondria antigen (Fig. 4g) with the exception of control plugs where structures were positive only for the endothelial marker. To prove whether endothelium derived from AFS cells could function, two distinct animal models were used to mimic endothelial dysfunctions: ischemic damage after femoral excision and carotid injury. Cells cultured in hypoxia were chosen because of their superior capacity to proliferate. After the femoral artery excision, Doppler analysis evidenced how the superficial blood circulation was significantly ameliorated in cell-treated mice compared with PBS-injected muscles (Fig. 5b); an increased number of CD31+ capillaries was also observed in treated mice (double staining for anti-human and anti-murine CD31 was negative; data not shown). 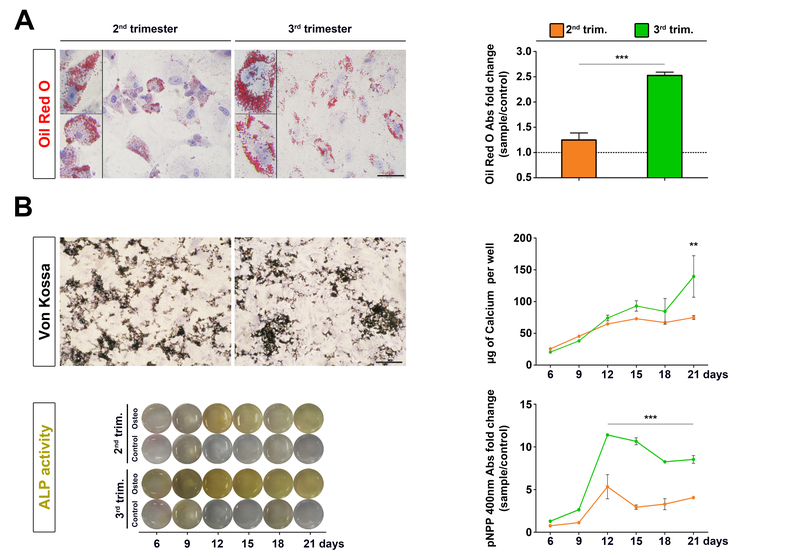 Although the difference in terms of CD31+ cells between PBS- and cell-injected muscles was not significant, the positive trend was noticeable after treatment with both second- and third-trimester AFS cells (Fig. 5c). By immunofluorescence for human antigens such as human Nuclei, anti-human Mitochondria and Lamin A/C, we tried to identify and confirm the participation of injected AFS cells in supporting angiogenesis and vascular regeneration in muscle, but very rare cells were found and no coexpression of endothelial marker was evident. Also, reverse transcription-PCR for human BM2 was performed without positive results (data not shown). Consequently, the endothelial recovery was postulated as outcome of a bystander effect. To study the indirect mechanism of endothelial reconstitution, a mouse model of electric carotid artery injury was subsequently used (Fig. 5d). After Evans blue injection, the impaired endothelium of control mice absorbed the blue staining while cell-treated animals underwent almost complete endothelial restoration 3 days after electric injury, as demonstrated by the very small presence of Evans blue-positive areas (Fig. 3e). In particular, AFS cells from the third trimester proved to be more effective than AFS cells from the second trimester in repairing the damaged artery. Given the endothelial wall of the cell-injected mice, it was clear how the shape was regained when compared with the loose endothelial wall of the PBS-treated animals. In the present study, we compared the features of AFS cells from the third trimester with the ones of the well-defined second-trimester AFS cells. Specifically, we aimed to assess both in vitro and in vivo the differentiation potential toward endothelial lineage of third-trimester AFS cells under hypoxic conditions. Cells derived from AF at term have only recently been considered as an alternative source of stem cells [12, 30], and in particular this is the first study that looks at the c-Kit+ population derived at term for endothelial regeneration. The antigen profile gains in importance on the definition of both stemness and immunological properties. The latter has been recently addressed, showing that AFS cells from the second and third trimesters inhibit T and natural killer cells in a similar manner . The evident overlapping of the characteristics of the two trimester sources has major implications since AFS cells from the last trimester of gestation are an easily available and abundant source without ethical concerns mainly because they are discarded material. It is possible that stemness maintenance during gestation is related to the low oxygen tension in the AF since oxygen concentration is a key element of both cell proliferation and differentiation . In this regard, without the addition of synthetic chemicals and coating, 5 % oxygen turned out to be sufficient to halve the doubling time and to keep mostly unchanged both the phenotype and the differentiation ability in respect to 20 % of oxygen. For the latest point, our method of culture turned out to be of paramount importance: contrary to other researchers , we were able to confirm the endothelial differentiation comparable to HUVECs. It is known that angiogenesis is a process starting from pre-existing vasculature and the first elements involved are endothelial cells that must activate to undergo proliferation, allowing the formation of new vessels. In our plug assay, AFS cells were able to switch from a stem to a more committed state and to build a functional endothelial network. In addition, the vessel formation inside the plug has been proven to be of human origin, further confirming that our cells actively contributed to the endothelial network. Specific ETS transcription factors essential for angiogenic differentiation and vessel formation  are constitutively expressed by endothelial precursor cells. Following the work of Ginsberg et al., we focused our analysis on ETV2, present specifically in fetal endothelial precursors, FLI1 and ERG1, detected in adult endothelial progenitor cells. Ginsberg et al. demonstrated how the insertion of the abovementioned genes in AF cells, depleted of c-Kit+ population, were able to easily convert AF cells into endothelial progenitor cells. Our results highlighted how c-Kit+ AFS cells are already transcriptionally open toward endothelial differentiation without the need of any genetic manipulation. ETV2, a marker of fetal endothelial precursor cells, was more present in AFS cells than in the CB cells used as control, whereas FLI1 was detected at a lower level in respect to the control (HUVECs). This agrees both with the fetal origin of AFS cells and with their stemness state, but these cells also display an open state toward mature endothelium formation. It is possible that microRNAs (miRNAs) have a role in the post-trascriptional regulation of those genes [33, 34]. Specifically, we chose to look into the expression of miR126, 132 and 210, which promote angiogenesis by targeting negative regulators in angiogenic pathways. Endothelial cell-specific miR126 plays an essential role in neoangiogenesis following ischemia  and was detected in AFS cells before endothelial induction and maintained during differentiation. Importantly, the expression of miR210, which is a key regulator of angiogenesis , rapidly increased after induction. In addition, we focused on the anti-angiomiR221 and 222 , which inhibit the process of angiogenesis by degrading positive regulators. It has been demonstrated how these two miRNAs regulate the angiogenic activity of SCF and the level of its receptor c-Kit . Our study underlines how AFS cells express also these anti-angiomiRs in the basal condition as if AFS cells could be ready to receive stimuli either in favor or against this endothelial differentiation. Overall, our in vitro results showed that AFS cells of the second and third trimesters both possess the gene expression profile for an efficient endothelial differentiation not only on the transcription factors side but also because the post-transcriptional modulators of angiogenic gene detection were revealed. Indeed it was evident that, although anti-angiomiRNA expression was maintained, cells in vitro were prone to differentiate toward endothelium, highlighting the ability to selectively receive and enhance the pro-angiogenic stimuli. Different sources of mesenchymal stem cells of fetal and adult origin, from CB to adipose-derived cells or embryonic stem cells, have been shown to contribute to endothelial regeneration but the functionality of these cells has been only partially proven in vivo [2, 39–41] or are difficult to expand in culture . In the well-established mouse model of ischemia used here, the cells were injected 48 hours after resection of both femoral arteries. In such a harsh microenvironment, the action of AFS cells of both trimesters was consistent and robust. They were indeed capable of ameliorating the blood flow as highlighted by Doppler analysis, although AFS cells were not detectable. This phenomenon is in keeping with previous literature describing that AFS cells exert an indirect effect through a paracrine action as demonstrated in the repair of intestine, kidney, lung and heart [43–46] and in a different model of endothelial damage . In this ischemia model, AFS cells exert a bystander effect, but to deeply investigate this aspect toward endothelial regeneration, we decided to use a different animal model always based on artery damage. This specific model, defined by Carmeliet et al. in the femoral artery and adapted by Brouchet et al. for the carotid damage, well represents a model of indirect endothelial repair. Indeed, Hagensen et al. investigated the mechanism of endothelial reconstitution, demonstrating how the model of carotid impairment itself regenerates spontaneously from the distal part to the centre of the damaged area. In particular, injured carotid from wild-type mouse transplanted into GFP animal proved how the activation of the resident healthy endothelium (GFP+ cells) toward the damaged area was the mechanism of the endothelium-restauration, giving up the theory that circulating endothelial progenitors cells could contribute themselves to de novo endothelial cells . However, when bone marrow or endothelial cells are injected in the same mouse model, the ability to re-build the artery wall has been demonstrated to be superior and quicker [51, 52]. For these experimental reasons, we decided to perform AFS cell injection in damaged carotid, believing that cell contribution could improve the endothelial healing via the bystander effect. Indeed, 3 days after damage, the reduced area with Evans blue staining confirmed the attained regeneration. Given that this model regenerates spontaneously in 10 days , the synergy between AFS cells and the resident endothelium was clear since in control animals no endothelial restoring was seen after 3 days. In addition, we can appreciate the stronger ability of endothelial recovery of our cells with respect to HUVECs or bone marrow cells . In this work, we compared the features and the endothelial properties of AFS cells from two trimesters, characterized mainly by different accessibility and abundance. AFS cells from the third trimester, which have the advantage of being available from healthy fetuses of scheduled cesarean section, proved to possess comparable properties with respect to AFS cells from the earlier trimester but were characterized by a quicker proliferation rate when cultured in hypoxia. AFS cells of both trimesters were able to differentiate both in vitro and in vivo into endothelial cells and, in two different disease models, did sustain residing endothelial precursor cells to rescue tissue function, with the third-trimester cells demonstrating a stronger action in the carotid mouse model. This is the first study that deeply characterizes the third-trimester AFS cells and investigates them as a new source for potential therapeutic applications. In the future, ex vivo engineering of endothelial structure using AFS cells will completely address the differentiation potential of AFS cells that so far did not directly generate new endothelium. Comparison of endothelial cells derived by direct differentiation or reprogramming could become necessary in order to decide the most efficient and safe method for their clinical use. This manuscript was financed by Foundation Institute of Pediatric Research Città della Speranza project number 12/01 and CARIPARO Foundation project number 13/04. MA is supported by a fellowship from Padova University (Assegno Senior - GRIC14PJ88). PDC is supported by the National Institute for Health Research (UK). AAS and MPo helped to design the study, produce and collect data, perform analysis and interpret it, and write the final manuscript. CF and MA helped to design the study, produce and collect data, and perform analysis and interpret it. MPi helped with the general conceiving of the work and in some practical analysis (immunostaining and fluorescence-activated cell sorting). GS and EB helped in the cell culture and sample collection. LU was involved in setting up the experiments regarding hypoxia and endothelial assays. SV and EC were directly involved in amniotic fluid sample collection and project discussion. GPF provided study material and performed data analysis on the in vivo part. PDC carried out general supervision in the design, made an intellectual contribution throughout the whole work, and helped to write the final manuscript. All authors read, critically reviewed, and approved the manuscript. Rasband WS. ImageJ. U. S. National Institutes of Health, Bethesda, MD, USA. 1997–2014. http://imagej.nih.gov/ij/. Accessed 1 Apr 2012 2012. Carpentier G. Angiogenesis Analyzer for ImageJ. 2012. http://image.bio.methods.free.fr/ImageJ/?Angiogenesis-Analyzer-for-ImageJ&lang=en. Accessed 1 Nov 2012 2012. Lloyd-Griffith C, Duffy GP, O’Brien FJ. Investigating the effect of hypoxic culture on the endothelial differentiation of human amniotic fluid-derived stem cells. J Anat. 2015 Mar 31. doi: 10.1111/joa.12283. [Epub ahead of print].